Details: Head to the link above and enter ‘industry’ in the promo code box. Then just search for hotels, dates etc as normal. When the results came through, we then ordered by price which made the travel industry rate more prominent, bringing it to the top of the page. Book By: Ongoing, the rates we saw also included . Eligibility: Valid for travel agents or airline employees. ID can be requested at check-in. Potential Savings: Amari have advertised savings of up to 50%. The first search we tried brought up a 35% saving spot good discounts clearly available. Ease Of Use: Straightforward and there appears to be excellent availability. The news that there is now a travel industry discount rate for Amari hotels is welcome as this is a range that covers some superb destinations including Bangladesh, Phuket, Doha, Pattaya, Hua Hin, Maldives and many more – they have a handy destination guide. The hotels are luxurious and modern and many rooms have outstanding views. With the travel industry rate for Amari hotels you save money (of course) but also retain the flexibility of being able to cancel at late notice on many of the offers – these are not discounts that always require pre payment (at least not in our experience). What more is there to say? Get browsing and potentially save yourself a packet. This page has all the latest discounted rates travel industry workers can enjoy in hotels, on flights and more. A belated Merry Christmas to all TID’ers! As we know the offers will come through thick and fast through peaks, so here’s a quick 5 day offer from Travelodge – as always with them, first come first served! Currently good availability – but 30% off most of their hotels for most dates from 01 Jan – 31 March. Remember that Travelodge do not offer Travel Industry exclusive rates so these offers are available to all – get in there quick! Link: Travelodge upto 30% off! Potential Savings: 30% off Travelodge’s already great prices! Details: Simply follow the link above and enter TIMA into the promo code box. Book By: Ongoing, however availability at some hotels availability seems limited so the advice would be to get bookings in as soon as possible ahead of any trip. Eligibility: Available to those in the industry. As they state elsewhere on their site, this includes travel agency, hotel or resort, airline, car rental company or cruise-line. I.D will be required at check-in. Potential Savings: We found savings of around 15% against the early booking deals, so savings would potentially be far higher against standard room rates. Ease Of Use: Fairly easy, however it’s annoying that on choosing a destination it doesn’t then filter out the hotels that aren’t in that destination (so the list remains lengthy). Centara have hotels in a wide range of destinations, including Thailand (Bangkok, Pattaya, Phuket etc), Sri Lanka, Maldives, Oman, Vietnam and Qatar. They are also truly exceptional hotels – affordable but also luxurious, well-equipped and with a wonderful level of service. We love Centara and will definitely be taking advantage of this offer (so get your bookings in quickly before we do). Their site is also well organised, with a selection of images and also key information for each of their hotels. Details: Book online via the link above – previously, you had to phone or email so it;’s nice to see the offer made more readily accessible. Eligibility: Valid for travel agents or airline employees. A staff ID card or similar will be required at check-in. Potential Savings: We believe savings of around 30% are possible. Details: Email or phone to make reservation. The email is [email protected] and calls should be to +852 3896 9800. Potential Savings: It varies, but there is around 30% to be saved against the standard rates on many dates, for instance the 1,000 Hong Kong dollars a room would cost per night on December 14 and 15 is a saving of almost 600 HK dollars. Ease Of Use: Straightforward – let us know how you get on. Details: Using the link above, you will access the travel industry rates – it is worth having two windows open, one using the above link, one the standard Hilton site you you can compare the prices. Book By: Ongoing, but you can only book the rate within 90 days of arrival. Eligibility: Valid for travel agents or airline employees. ID can be requested at check-in. In fact, it was requested for one of our stays, but a Business Card was sufficient proof of ID. Potential Savings: 50% is possible, though the offers are often only for quieter days. Ease Of Use: Straightforward, however availability can be limited. Unfortunately, using flexible dates in the search seems to disable offers. 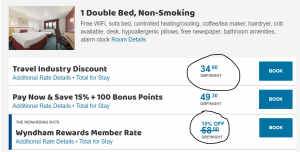 Hilton do offer travel industry discount deals, but availability varies greatly by hotel, in many hotels it is often only possible to get a discount on a quieter day (i.e. Sundays). 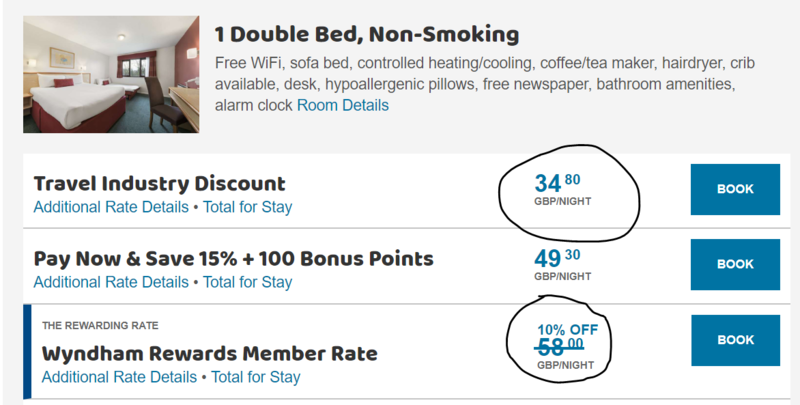 In some cases, the discounts only seem to be available for hotels within the next 90 days. However, that’s the negatives out the way. The great advantage of Hilton is that they have such great reach, so many hotels across the globe – more than 500 hotels in 78 countries (at the time of writing). In Europe they tend to focus on larger urban settings, but you will find stunning Hilton hotels in Bora Bora to Miami Beach. Discounts of up to 50% are available for travel agents or airline employees and it is very straightforward for checking availability. We find that Hilton are not overly generous in the availability for travel agent rates but there are some great discoveries to be found. For example, the popular Hilton Brighton Metropole seems to be available on Sunday’s only, however there are real savings to be made. We ran a search and found that a King Guest Room was available with a 30% reduction on the summer sale price and a 52% reduction on the standard internet rate. A suite with a sea view was 49% less than the standard internet rate. If the discounted rates are only available for a Sunday but you want the whole weekend you could of course ring the hotel so they can sort everything in one booking, rather than having to much around making two separate bookings online. Who knows, they might even give you an extra discount over the phone.